As part of the increased functionality of UBL 2.0 we would like to propose a more refined approach for cross referencing documents. UBL 1.0 currently has a structure known as Document Reference. This contained an ID, Copy Indicator, Issue Date and a GUID. In UBL 2.0 we intend to add a Qualifier BBIE and two ASBIEs, IssuerParty and RecipientParty to this set. As it stands Document Reference only supports the first requirement. 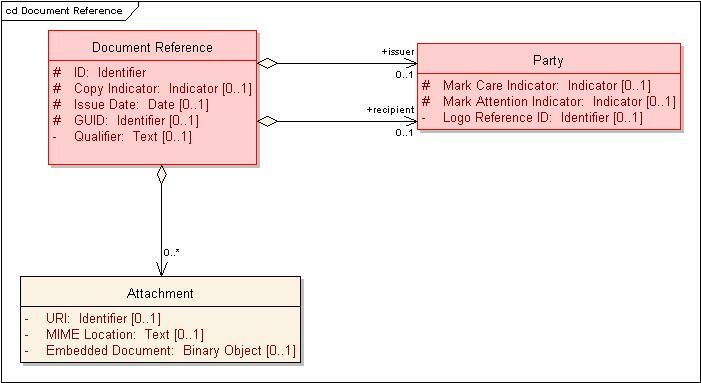 To address the third requirement - attachments, we propose a new ABIE called Attachment that contains a URI, MIME Location and Embedded Document (as a Binary Object). A Document Reference could then associate with zero to many Attachments. The diagram below shows these relationships. To address the second requirement - the xpath reference, we propose creating a new document type, to be called Referenced Document. This would have the Document Reference as its root ABIE. The actual document content would be the Embedded Document in the Attachment to the Document Reference. This creates a 'wrapper' UBL document that can contain anything. As a benefit, one of the possible uses for this type of document referencing can be for Digital Signatures. The text of the signature can be either an attached (type 2) Document Reference or an embedded (type 3) Document Reference. As this proposal involves creating a new (and generic) UBL document type we welcome opinions and comments from all TC members. However, we need this discussion concluded before Friday December 9th to allow this to be incorporated into the review package.